It was supposed to have been a peaceful Christmas eve spent reading ghost stories to his students. That is, until a terrified Russian man arrived at Professor Dunning’s to seek shelter. That’s when things took a turn for the bizarre when some sort of invisible being arrived and pushed the man out the window. Things only get more bizarre when the police coroner reveals that the deceased had somehow been drowning during his fall! Teaming up with Detective Inspector Lionheart, Dunning find himself drawn deeper and deeper into a world of unexplainable deaths and a mysterious secret society (as if there’s any other kind). It’s easy to see why The Scarifyers: The Nazad Conspiracy made such an impact back when it premiered in 2007. It has the perfect mix of chuckles and chills, along with excellent acting and a great musical score. Nicholas Courtney and Terry Molloy play off each other well right from the start and David Benson’s portrayal of Aleister Crowley is absolutely hilarious. Naturally, this all led to further installments in the series, along with airings on BBC Radio 4 Extra. The performance pulls in the listener so well that the 84 minute running time seems to fly by. 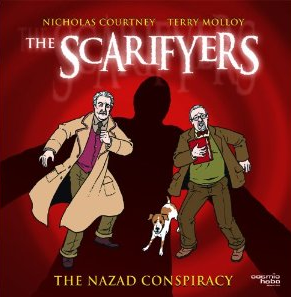 Bafflegab Productions offers The Scarifyers: The Nazad Conspiracy as both a digital download and CD, although I highly recommend getting the 2 disc special edition CD version. Said edition includes both an isolated soundtrack and a short 34 minute episode of the Scarifyers called The Yule Lads where Lionheart and Dunning cross paths with the titular Icelandic trolls. But no matter which version you choose, you’re sure to be in for a great listening experience. Special thanks to Bafflegab Productions for use of the image!